Faculty at Minneapolis College of Art and Design have voted overwhelmingly to unionize after an organizing drive sponsored by Local 284 of the Service Employees International Union. The election results were announced this afternoon, just days after adjunct faculty at Augsburg College filed for a union election of their own. Negotiations on first contracts for MCAD faculty could begin before year’s end. Faculty members said they looked forward to using their collective voice to advocate for themselves and their students. “I am thrilled to see such a resounding vote for forming our union amongst both part-time and full-time faculty,” adjunct media instructor Daniel Dean said. “Now, we can work together towards changes that will improve our working conditions as well as our students’ experience. For Augsburg adjuncts, the timeline of their organizing election has yet to be determined, but faculty requested an election by mail ballot in November. 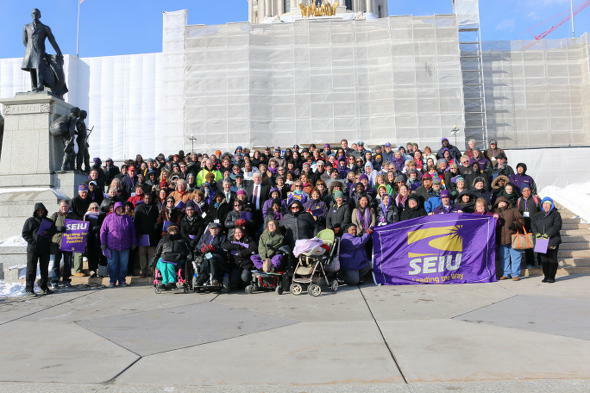 Over 11,000 faculty members nationwide have formed unions with SEIU in the last three years, including adjunct faculty at Hamline University in St. Paul, who voted to join Local 284 in June 2014. Augsburg adjuncts aren’t the only local faculty poised to vote in an organizing election. Tenure-track and contingent faculty at the University of Minnesota – Twin Cities campus have filed for an election, but the university’s administration has bogged down the process with legal appeals.